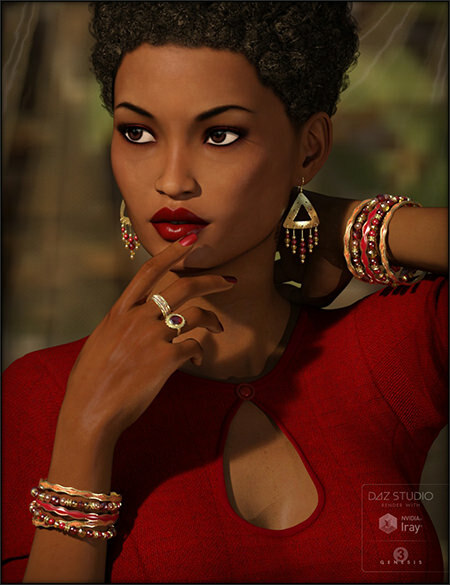 An assortment of beautiful jewelry for your Genesis 3 ladies plus shader presets. Two ring props with multiple loading options and finger morphs for Genesis 3 Female to squish her fingers into them. Two Bracelet props that load left or right and in easy pre-made sets. Two pairs of conforming earrings, both rigged with extra bones so you can easily adjust each side as needed for gravity. All items are impeccably UV mapped and have multiple material zones. The set comes with 103 pre-made material presets but also includes 44 gem, metal, and shiny plastic shader presets for Iray and 3Delight render engines that will work on anything so you can chose nearly endless combinations. This set was previous sold on another site for a different figure, some geometry and UV mapping has been updated and it is now in native Daz Studio format. Items have been updated to fit Genesis 3 Female and all materials and shader presets have been completely remade.